Cockscomb Marcasite: Tabular crystals of “cockscomb” marcasite with spear tip terminations, grown on a base of fluorite. 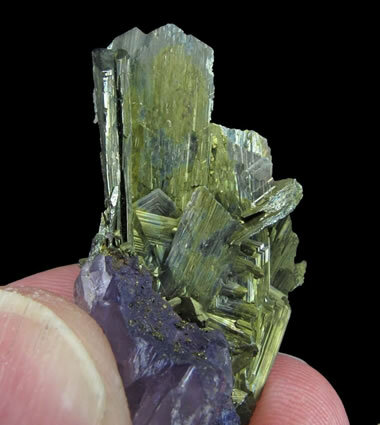 This specimen was collected from the Denton Mine, a fluorite producer in Illinois. It measures about 4.1 x 2.0 x 2.0 centimeters. Specimen and photo by Arkenstone / www.iRocks.com. Marcasite is a yellow to silvery-yellow iron sulfide mineral with a chemical composition of FeS2. It forms by precipitation from acidic waters in surface or near-surface environments. Marcasite is commonly found in sediments, sedimentary rocks, and hydrothermal deposits in many parts of the world. Marcasite has historically been used as a source of sulfur; however, today it does not have any significant industrial use. Color Pale bronze yellow to silvery yellow on fresh surfaces; however, marcasite tarnishes easily and specimens will alter to a brownish color over time even in an office environment. Luster Metallic when fresh, submetallic after tarnish. Uses A historical source of sulfur. Some gemstones and jewelry items are reported to be made of marcasite, but most of these are actually pyrite or made from a metal with a similar appearance. Marcasite is similar to pyrite in appearance and physical properties, and it has the same chemical composition. However, the two minerals differ in crystal structure. Pyrite crystallizes in the isometric system, while marcasite is orthorhombic. The most important difference between pyrite and marcasite is their difference in stability in the surface and near-surface environment. Marcasite is much more reactive than pyrite, and it alters at a much more rapid rate. Marcasite will tarnish rapidly when exposed to the weather and will even tarnish in the specimen drawers of a classroom. When stored in a location with moderate humidity, marcasite specimens can alter to form ferrous sulfate minerals. 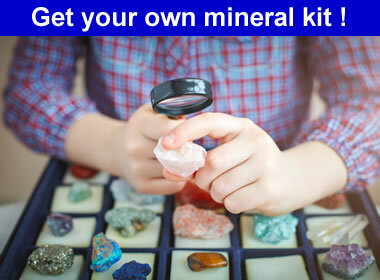 In the presence of moisture or humidity, these sulfate minerals can produce small amounts of sulfuric acid that can damage specimen notecards, specimen boxes, and adjacent specimens. The reaction can discolor the wood or cause rusting of the drawers of a specimen cabinet. Marcasite specimens should be stored where humidity can be controlled and where any alteration will not cause damage. People who have experience with pyrite and marcasite hand specimens can often tell them apart solely on the basis of their color or tarnish. However, crystal form, if observable, provides a conclusive separation. The streak of pyrite can be slightly greenish while marcasite is a pure gray. In reflected light microscopy of polished coals and ore specimens, marcasite will have a noticeably whiter color than the brass yellow of pyrite, although inexperienced observers might see them side by side and assume that both are pyrite. The conclusive text is observation under crossed polarizers when marcasite can produce interference colors of green, blue, and reddish brown. Marcasite Crystals: Brassy crystals of marcasite with minor dolomite from Cherokee County, Kansas. It measures about 9.0 x 4.8 x 4.5 centimeters. Specimen and photo by Arkenstone / www.iRocks.com. Most marcasite forms in one of three ways: 1) as a primary sedimentary mineral; 2) as a product of low-temperature hydrothermal activity; and, 3) as a secondary mineral that forms during the alteration of other sulfides such as pyrrhotite or chalcopyrite. Most conditions of marcasite formation are at relatively low temperatures and elevated acidity. Marcasite has an economic significance when it is found in coal. It contributes to the sulfur dioxide emissions during the combustion of coal. When coals are analyzed for their sulfur content, they are often leached in the lab with nitric acid. The amount of sulfide mineral in the sample is estimated by calculation based upon the amount of dissolved iron in the nitric acid leach. The result is reported as “pyritic sulfur” - which disregards that some of the iron might have been contributed by marcasite. Most coal seams contain very little marcasite, but in some coal seams marcasite can be the dominant sulfide mineral and primary source of sulfur. Marcasite can form in organic-rich clays and peats during their sedimentation or during diagenesis. The organic debris in these sediments produces a slightly acidic environment that is conducive to the formation of sulfide minerals. Pyrite is the more common sulfide to form, but this is also a common environment of marcasite. In clays and limestones, pyrite and/or marcasite often form in the microgeochemical environments that surround fossils or pieces of organic debris. Occasionally entire fossils are replaced by pyrite and rarely marcasite. In hydrothermal deposits, marcasite can be one of many sulfide minerals to be deposited along veins and fractures. Hydrothermal marcasite is often associated with pyrite, pyrrhotite, galena, sphalerite, fluorite, dolomite, or calcite. Until the early 1800s, many people used the word “marcasite” and its foreign equivalents collectively for pyrite, marcasite and other yellow iron sulfide minerals. It was not until 1845 that marcasite was recognized as an orthorhombic iron sulfide and different from pyrite. Pyrite is widely known because of its nickname of “fool's gold.” Pyrite is also a “ubiquitous” mineral, meaning that it is “found everywhere.” By comparison, marcasite is much less common and not as widely recognized by people who study rocks. Because of this many people have seen marcasite in the field and assumed that it was pyrite, a much more common, much more probable, and much more front-of-mind mineral. 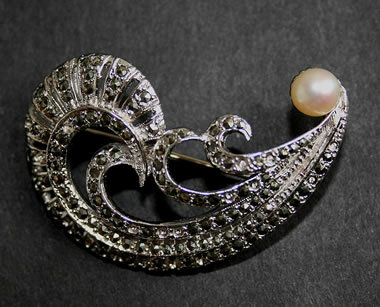 “Marcasite” Jewelry: A “marcasite” brooch made from pyrite, pearl and silver. The small faceted stones in the brooch are cut from pyrite rather than marcasite. “Marcasite” jewelry is occasionally encountered for sale today, but it was much more popular in Victorian and Art Nouveau designs of the late 1800s and early 1900s. Much of this jewelry was not made with marcasite. 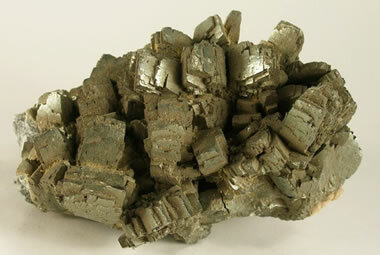 Instead, most was made with pyrite or imitation “gemstones” made of metal. Mineralogical marcasite is almost unknown in this jewelry even though the name “marcasite” is used for it. True marcasite is a poor choice for jewelry because it is brittle and chemically unstable. It tarnishes quickly and sometimes alters to sulfate minerals which can be corrosive when exposed to moisture or humidity. Marcasite has been used in the past as a minor source of sulfur and for making sulfuric acid. Today, marcasite does not have any significant industrial use.